At the beginning of the 1930’s, Göttingen belonged to the mid-sized universities with an academic staff of 238 people and approximately 3,000 students. The Georgia Augusta was regarded as a “working university” – the scientific demands were high – and at the same time seen as socially elite, and it was popular among the socalled higher levels of society. In the 1920’s, the greater majority of Göttingen professors were German national conservatives – and that always also meant an anti-Semitic disposition. In the German student body, the development of the political right wing grew increasingly stronger towards the end of the Weimar Republic, mainly carried by the student societies. It reached the high point of its organizational development in 1932/1933, when approx. 80 percent of the male students belonged to a student society, 50 percent of them were dueling fraternities. Characterized by anti-rationalism, myth of the frontline soldier, ideas of the national community, anti-Semitism and opposition to the “Weimar regime”, there was a great ideological closeness to the National Socialistic German Student Society, which gained the majority in the student representation at the Georgia Augusta in 1931. Although there had already been professors and student groups to the left (Leonhard Nelson, Hannah Vogt), there had only been isolated cases of opposition to the national socialistic “Gleichschaltung”. The professors Heinrich Düker, Gottfried Ewald and Heinrich Straub can be named, as well as followers of the Confessional Church among the theology students, who opposed the debasement of the Old Testament. In the course of the “Gleichschaltung”, the leader principle was also introduced at the universities, which made the rector the “leader” of the university with the authority to issue directives. The first rector with this new authority was Friedrich Neumann, who took up his post in May 1933 and at the same time became a member of the NSDAP. Neumann was especially suited for this task in the eyes of the new rulers, because he was acceptable for them as well as for the majority of his national conservative professorial colleagues. During his office (until 1938 as rector, then until 1943 as prorector) Neumann conducted the national socialistic “Gleichschaltung” and alignment of the University without recognizable doubts, consequently and emphatically. Symbolic for the practically unopposed submission to NS-rule is the way the “personnel political cleansings” were smoothly conducted due to the “Law for the Restoration of the Professional Civil Service” of April 7th, 1933, in which 45 professors were dismissed from the Georgia Augusta. Among the victims were important scientists such as Max Born, Richard Courant, Emmy Noether, Herman Nohl, Nikolaus Pevsner, Wolfgang Stechow and Gerhard Leibholz. It took several years for the Georgia Augusta to recover from this great loss. In a further escalation of exclusion and humiliation, the national socialists divested their opposers and victims of their academic degrees. 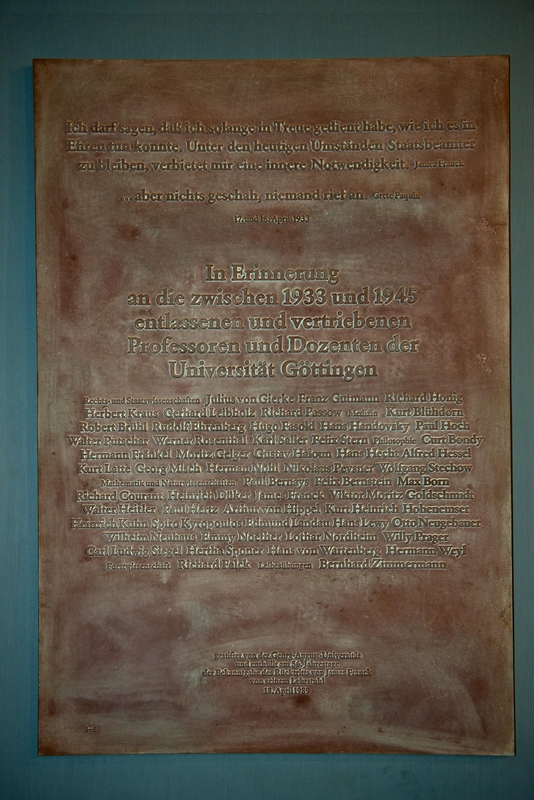 In Göttingen, 72 such cases are known, which took place during the winter semester 1935/36 and the summer semester 1944/45, whereby in 27 cases the titles were removed due to penalties for the most various “offenses” (high treason, racial defilement, abortion, breach of exchange control regulations) and in 45 cases due to denaturalization. Among those affected were world famous personalities such as Max Born and Ludwig Quidde, who generally suffered less from this harassment than the many other less renowned victims. Gedenkstele zur Erinnerung an das "Judenhaus"